Psalm 118 is the last of the Hallel psalms; which is a series of psalms that the Jews use on festivals recalling the escape from Egypt. Hallel is a song of praise. This ending Hallel psalm focuses on the king. The king’s victory manifests the steadfast love of the Lord and His name is extolled and exalted above all the nations. The psalm demonstrates trust in the Lord and promises to thank and praise the Lord. It opens by calling all people to give thanks, then it gives testimony to a victory won when recourse was given to the Lord who came to their rescue. With a victory chant the victor goes to the temple to offer thanks. The people recognize the victory is the work of the Lord. We see it in the quoted verse, since the victory is the Lord’s doing the people proclaim, “This is the day the Lord has made, let us rejoice in it and be glad.” The people organize a procession singing and rejoicing and the psalm ends repeating thanks for the Lord. This line is often repeated by those who trust the Lord. It is used as encouragement and as thanks. 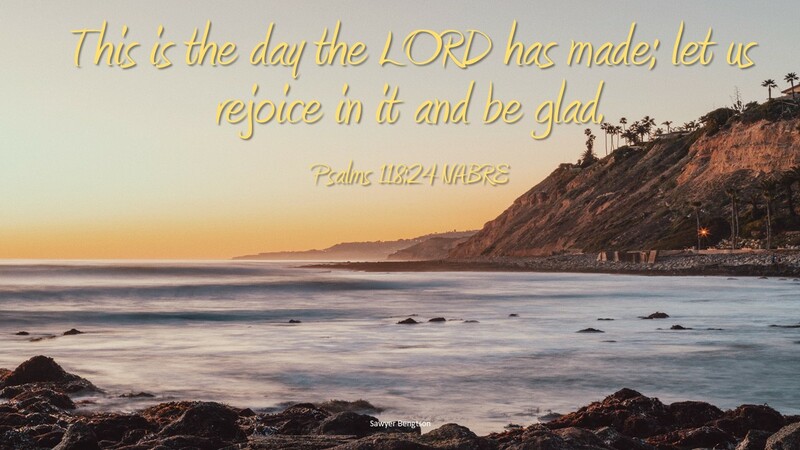 Each day is a day made by the Lord. Followers of the Lord who give Him complete trust know, despite what happens in the day it will be a day to rejoice and be glad. Once we are the Lord’s then what happens in our day is in the hands of our Lord and we can expect that it will be successful, even if it is a day where we learn growth through loss. Once we are committed to God, declaring all we have and do is for the Lord, we can expect each day will be a day of rejoicing, because each day will be a day the Lord has made especially for us. Do you commit your day to the Lord? How do you respond at the end of each day, do you thank the Lord or are you cursing?